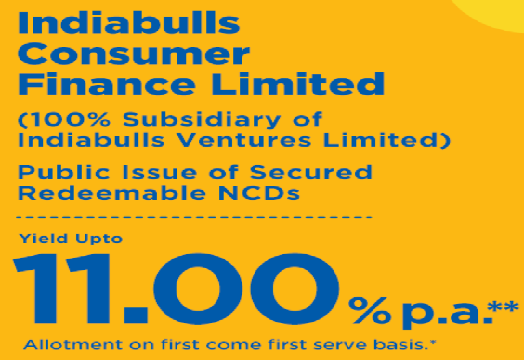 Indiabulls Consumer Finance NCD FEB 2019 Public Issue: IB Consumer Finance NCD Details, Features, Credit Rating, Reasons to Invest, Price, Date, Allotment, Listing, Reviews, Status & How to Apply? Non Convertible Debentures are one of the fixed income options that quench investors hunger. The interest rate proffered by the fixed deposits schemes may have touched the lowest levels which compel the investors to look out for better investment options. India bulls consumer Finance Ltd is all set to launch the NCD issue. It is going to offer secured redeemable NCD. What is the Credit rating of the Indiabulls Consumer NCD issue? How to Apply the IB Consumer Finance NCD Issue of 2019? The proposed public issue of these Bonds will be open for subscription from 4th February 2019 to 4th March 2019. The yield has high as 11.01% per annum and attracting customers now. India bulls consumer finance limited has great from Brick Works Ratings and CARE. Should you invest in Indiabulls Consumer Finance NCD of Feb/March 2019? What are the factors an investor should consider before investing Indiabulls Consumer Finance NCD of 2019? In this article, I would state interesting insights about IB Consumer Finance Ltd NCD. So, our today’s post is centered around India Bulls NCD. Stay tuned with the end to read about Indiabulls NCD also check Upcoming NCD in 2019. The debenture is a kind of debt instrument which offers a fixed rate of interest for a specified tenure. Many companies and government resort to debenture for the purpose of borrowing money. In simple words, it is the loan taken by the company and do not provide ownership in the company. There are two kinds of debentures convertible and non-convertible debentures. The convertible debentures are those that can be converted into the equities shares at a later time. But, the interest rate offered by such debentures is low. Nonconvertible debentures do not get converted into the equity shares at a later time thus, can generate higher returns. An NCD can be Secured or Unsecured. Secured NCDs are backed by the issuer company’s assets to fulfill the debt obligation, unlike unsecured NCDs. Indiabulls consumer finance limited came into the existence in the year 1994 is a wholly owned subsidiary of Indiabulls Ventures Limited, one of the financial services companies of Indiabulls group engaged in providing securities and derivative broking services. The company is registered as a non-deposit taking systematically important in a banking finance company and the primary focus on personal loans, unsecured SME loans, and secure SME loans. Indiabulls Consumer Finance is all set to issue secured redeemable Non-Convertible Debentures (NCD’s) to the tune of Rs 250 Crores with a choice to retain another Rs 2,750 Crores over subscription totaling to Rs 3,000 Crores. It comes with 8 different options, which contains 26 months, 38 months and 60 months tenure NCDs. On March 31, 2018, its gross NPAs as a percentage of AUM was 0.05%, and net NPAs as a percentage of AUM was 0.05%. Issue Closes on: 4th Mar 2019. Interest Rate or Coupon Rate on NCDs: The ROI ranges from 10.40% to 11% depending on the category of investor and tenure of the NCDs. The frequency of Interest payment: Monthly & Annual. Cumulative options are also available. Minimum Application size: Rs 10,000 (10 NCDs) and in multiples of Rs 1,000 thereafter. Listing: The NCDs are proposed to be listed on BSE & NSE stock exchanges. Security & Asset Cover: The Company and Promoter will create and maintain appropriate security in favor of the Debenture Trustee for the NCD Holders on the assets adequate to ensure required asset cover for the Secured NCDs. Credit Ratings: Credit Rating of “CARE AA; Outlook: Stable” for an amount of Rs. 3,000 crore, by CARE Ratings Limited and “BWR AA+; Outlook: Stable” for an amount of Rs. 3,000 crore, by Brickwork Ratings. Issue Allocation Ratio: 30% of the Issue is for retail investors & 30% for HNIs (HNIs – individuals (applying for an amount of > Rs 10 lakh). Interest income was Rs 6.6 Crores for FY16 Vs Rs 26.2 Crores for FY2018. Net profit improved from Rs 1.3 Crores in FY16 to Rs 191.5 Crores in FY18. Net NPA is at 0.05% as of March 31, 2018. TDS is not applied to the listed debentures’ interest payouts (which are in Demat form). Else, TDS will be applicable if the interest exceeds the threshold limit of Rs.5,000/- in a financial year. Interest yield on NCD bonds is taxable according to the slab of the investor. If you sell NCDs on stock exchange before one year from the date of purchase, Short Term Capital Gains Tax is applicable. Tax rates depend will solely depend on the tax slab you fall into. These Indiabulls Consumer Finance Limited NCDs of February/March 2019 would get listed after 6 working days from the date of closure. Means it would get listed approx. On 13th March 2019 assuming that it would continue till 4th March 2019 i.e. the last date of subscription. If it is subscribed earlier and subscription closes, it would get listed after 6 days from such closure. Why to Invest in IB Consumer NCD? The company enjoys a great credit rating by Brickworks and CARE. Why not invest in Indiabulls Consumer Finance Feb 2019 NCD? High level of clients defaults and the resultant non-performing assets could adversely affect its company business, financial condition, results of operation and future financial condition. They are prone to the volatility in interest rates and may face interest rate and maturity mismatches between its assets and liabilities in the future which may cause liquidity issues. The company is subject to supervision and regulation by the RBI, as an NBFC-ND-SI, and other regulatory authorities and changes in the RBI’s regulations and other regulations, and the regulation governing Company or the industry in which Company operates could adversely affect its business. Company business requires considerable capital and any disruption in the sources of its funding or an increase in its average cost of borrowings could have a material adverse impact on the company. The investors can check all the risk factors in the company’s prospectus. as NBFC company are suffering liquidity crunch and then there is a possibility of delay in the payment of interest. Do you want to invest in such NCD then? Are NCDs totally risk-free? – No, they are not risk-free. These carry a higher risk than bank deposits. The main risk with NCDs is default risk. The issuer may not be able to pay the interest payments. Best Share Trading Apps 2019 How to Invest in Share Market? The investor can apply to this NCD in a demat form only. If you have a demat account, you can log in to your account and go to IPO/NFO/NCD section and apply for the same. The procedure for applying NCD would be through ABSA (Your amount would be blocked initially and upon allotment, your amount would be deducted and NCD allotment would be done, else your amount would be unblocked) You can reach out to any of the lead managers websites to know more details on how to apply them. India Bulls finance limited offers lucrative interest rates. Secured NCD is somewhat better than unsecured. In an investment, it is always suggested to take a well-informed decision. If you are a high-risk taker and willing to invest in such companies even after IL and FS scam, you can consider investing in secured NCD FOR 26 Months or 38 Months. If you enjoyed this post regarding India bulls NCD you can share it among other via the social media. You can reach us through the Comment section below.